On this list was one of history’s most infamous companies, Kodak, who at its most successful point captured 90% of the film market in the United States.2 Kodak went from booming to bankrupt. The reason? 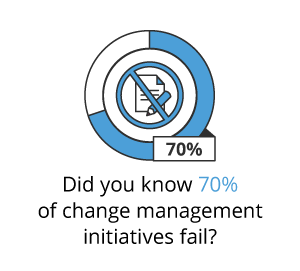 A total lack of change management. Privately think, explore and debate the need for change for a long period and then launch into the initiative, forgetting others haven’t been a part of the discussions from the get-go. Boycott or become resistant to the project altogether due to lack of knowledge about change management. 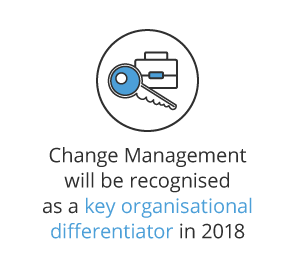 Although the discipline of change management has been around since pre-1990s, a top trend expected for 2018 is the formalisation and maturation of change management, with the inclusion of online communication tools, computer-based training, and gamification of learning.5 However, without all stakeholders on board, your change management strategy will fail; in fact, 70% of change management initiatives do.6 The success of your change management approach depends on persuading every individual in the company it’s time to change the way they work. It’s been predicted companies will recognise change management as a “key organisational differentiator” by the year 2018 as they begin to feel the pressure to become more resilient and take a proactive stance towards customer and market trends.7 The movement towards accepting that change is a necessary component of any business will ensure a climate for change is created before attempting to implement any change strategy. Employees will be prepared and constant change will not cause disruption, but rather form a part of everyday life in the workplace. Create and update your vision: always have an idea of where the company is going – whether you’re CEO or the most recent employee, it’s essential to know the company’s reason for existence from the beginning and understand that this vision will continually be updated. Complete involvement: include every person in the company from the beginning so everyone understands the need for continual change, ensuring no one will be surprised when it is implemented. Vary your communication: hold regular company-wide meetings, face-to-face check-ins and create videos explaining the current status of the company and where you plan to take it, considering every individual’s feedback along the way. Every change initiative takes time. CEOs and entrepreneurs now have the opportunity to embrace inevitable and necessary change within the business instead of fearing it. However, before embarking on complex performance-improvement programs, it’s essential to determine the extent of change required to achieve desired business outcomes. The quickest way to save on both costs and time is to simplify tasks before creating an implementation plan. The content of change management is relatively acceptable, but the managerial capacity to implement the plan is underdeveloped. Many companies outsource specialists or consultants instead of strengthening their managers’ knowledge and abilities in change management.11 This leads to employees growing cynical when change is announced, due to failed change management initiatives of the past. Businesses will do well to train their current employees by sending them on change management training or aiding them in the completion of change management online short courses. It’s essential to understand the approaches, models, and tools that can be applied to various change contexts, organisations, and situations, before attempting change within your organisation. The business that can anticipate and address change proactively is the one more likely to remain competitive and relevant. Leverage the one thing you can truly count on – change. 4 min Explore effective tools you can use to plan for the future of your organisation and download our business planning template. 3 min Your guide to intentional career planning and consequent success in 2018 is here. 4 min The risks, commitment, sacrifices and sheer determination involved could be enough to turn away even the strongest of Entrepreneurs.